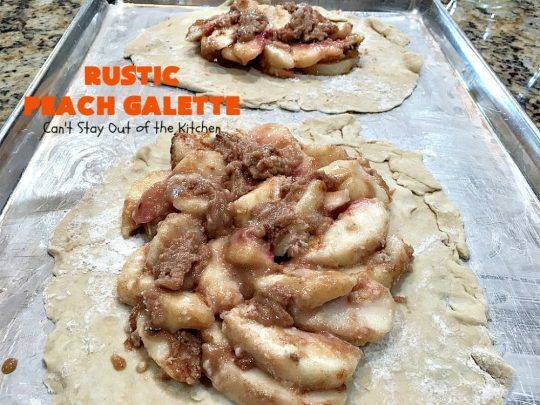 Rustic Peach Galette will knock your socks off! 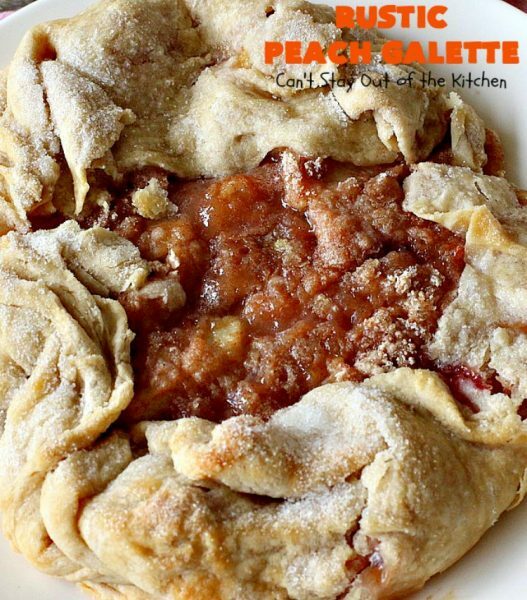 A luscious white flesh peach filling is piled onto Homemade Pie Crust and formed into a round or galette shape. I used my Mom’s Homemade Pie Crust recipe and the filling for my Double Crust Peach Cobbler recipe. After bringing up the sides of the crust over top of the galette, I brushed the crust with milk. Then I sprinkled the wet crust with sugar. They baked up to perfection. And yes, they were heavenly. While I served mine with whipped topping, they would be superb with ice cream. For those of you without the inclination to make homemade pie crust, use regular store-bought pie crust. It will work fine. For those of you who prefer your own version of pie crust, I make one recommendation. Roll your crust out thick. It will work easier that way and not tear as much. You can try to arrange the peach slices in a pretty fashion if you desire. 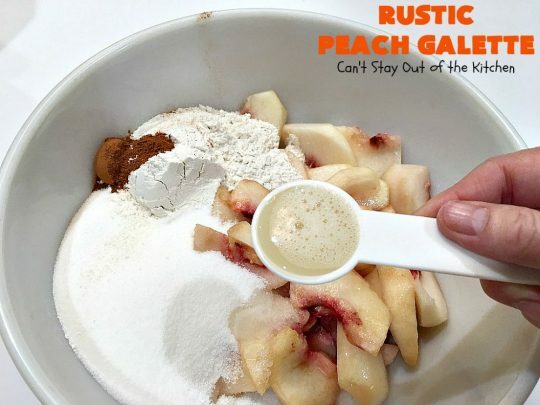 But honestly, it’s hard to do that when the peaches are mixed with sugar, flour, cinnamon, etc. 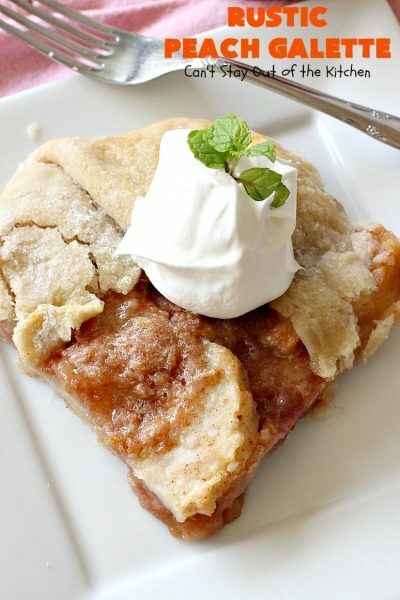 I have to admit, I love Peach Pie. I have several versions for it. My mom’s recipe, a Peach Crumb Pie, Peaches ‘n Cream Pie, a Betty Crocker version, in Cinnamon Roll form and a Peach Slab Pie. I also have about ten or fifteen Peach Cobbler recipes, about 20 peach cookie or peach brownie recipes and 5 to 10 peach dessert recipes. Not to mention, about 10 to 15 Peach Muffin recipes and another 10-15 Peach Cake recipes. Yes, our family loves peaches. When we had our own peach trees a few years back I was making peach desserts in the summer constantly. This year I was contacted by representatives of the Washington State Stone-Fruit Growers to blog about my experiences with their peaches. In this case, white flesh peaches. 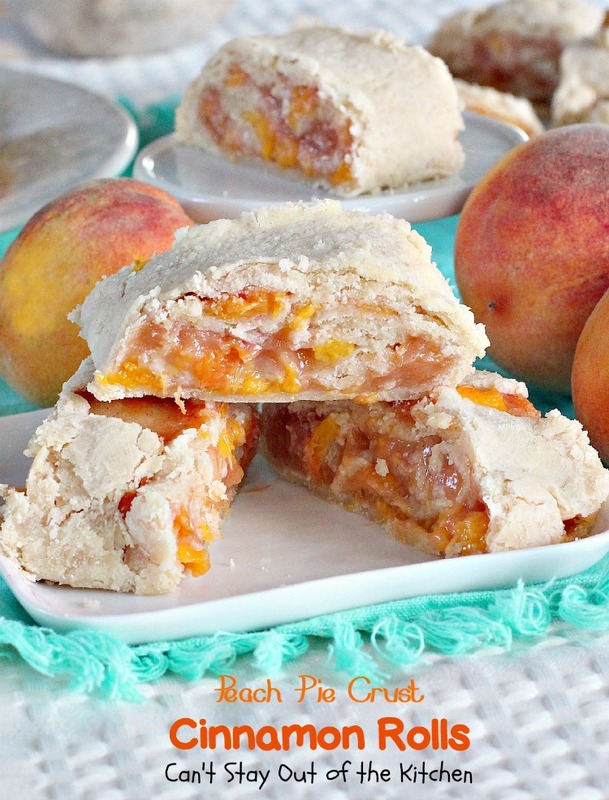 I knew I was on a time crunch because peaches won’t be available in stores too much longer. But I decided to give it a try. 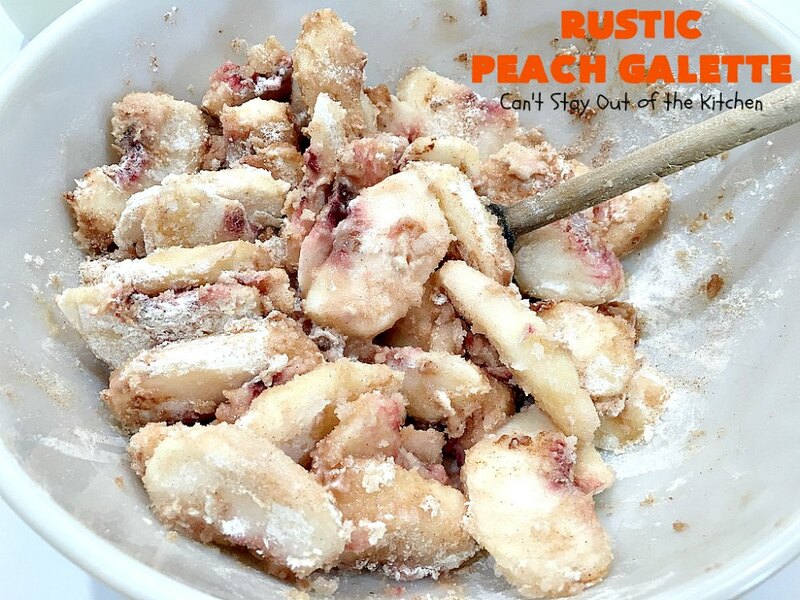 I used up the 10-pound box of white flesh peaches in two desserts. The first one was a Peaches ‘n Cream Custard. The second dessert was a Rustic Peach Galette–except that I made FIVE of them! 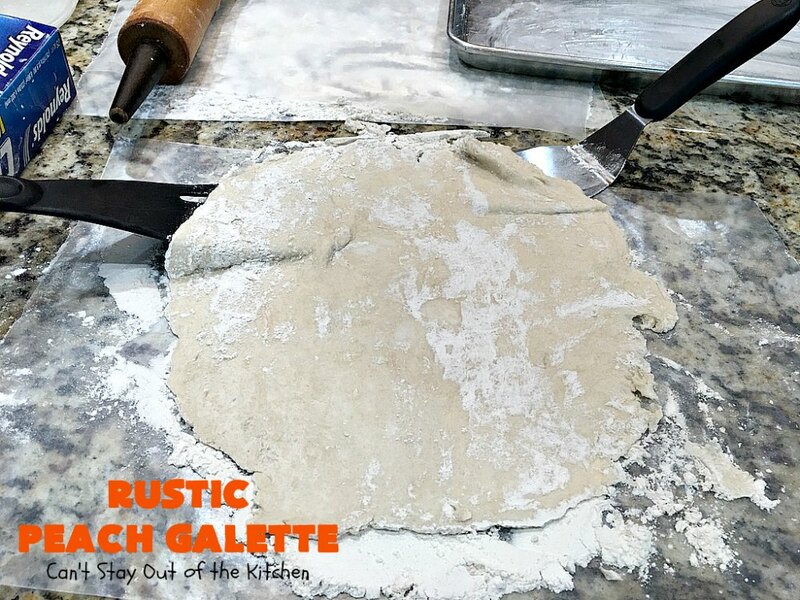 This recipe actually makes two galettes – to serve about 8. 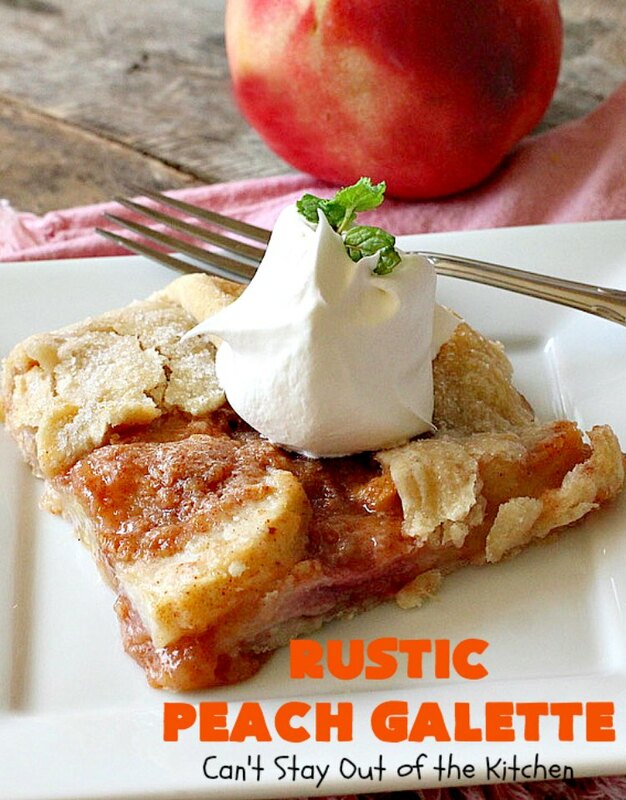 I made 2 1/2 batches of this recipe in order to use up all those peaches. I gave one of the Rustic Peach Galette’s away to a neighbor across the street. It was a “thank you” for mowing our lawn after John was recuperating from surgery. I gave another one to a family in our care group who was in the process of moving. And, I gave two to another family in our church who have a lot of family staying with them at the moment. I sent the galettes along with a large tray of Pesto Hummus and fresh veggies. They are always happy to be guinea pigs for things I make. The fifth one, I saved for ourselves (of course). I had to fight my husband to get my share. Yum. Without exception, everyone raved over this dessert. I could have easily eaten all five of them myself. 🙁 But I resisted. 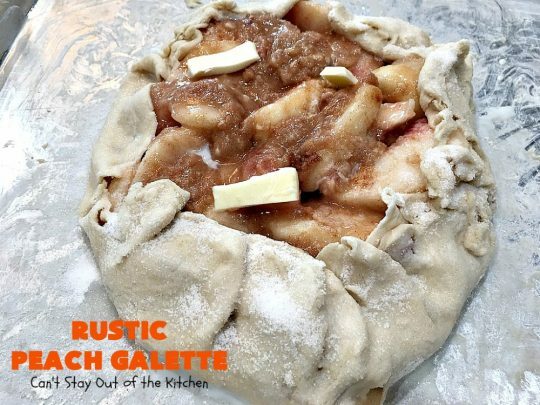 😉 Still, Rustic Peach Galette is one of those desserts that you will drool over from the very first bite. But you’d better hurry. 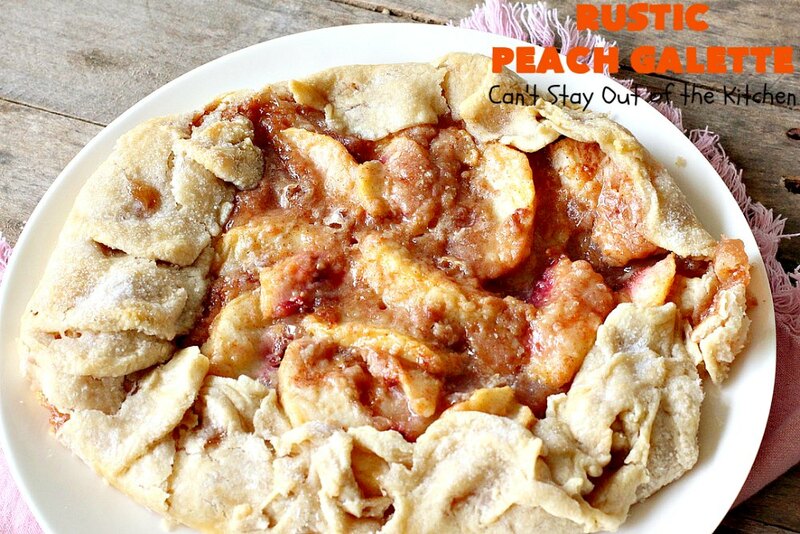 If you want to try this recipe, get to the store immediately and purchase peaches before they go out of season. Prepare to drool. 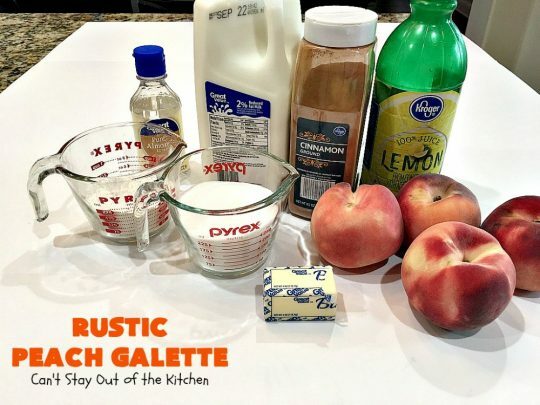 Rustic Peach Galette is an awesome dessert. 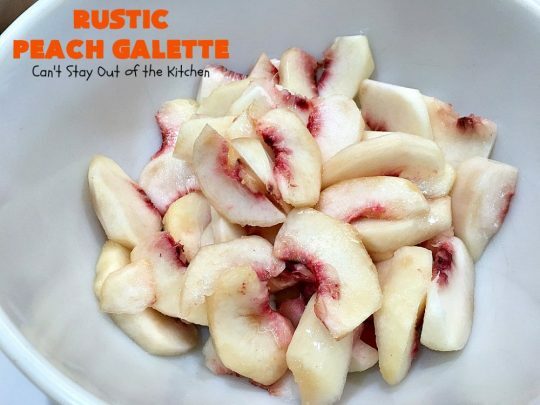 I made five of these luscious peach desserts. 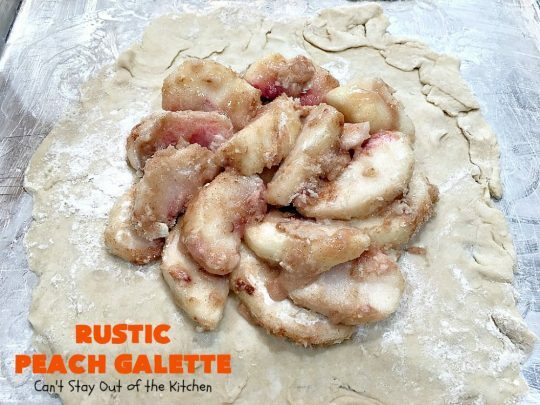 Each slice of Rustic Peach Galette is awesome. I liked it with whipped cream, but this is also terrific served with ice cream. I used these ingredients. 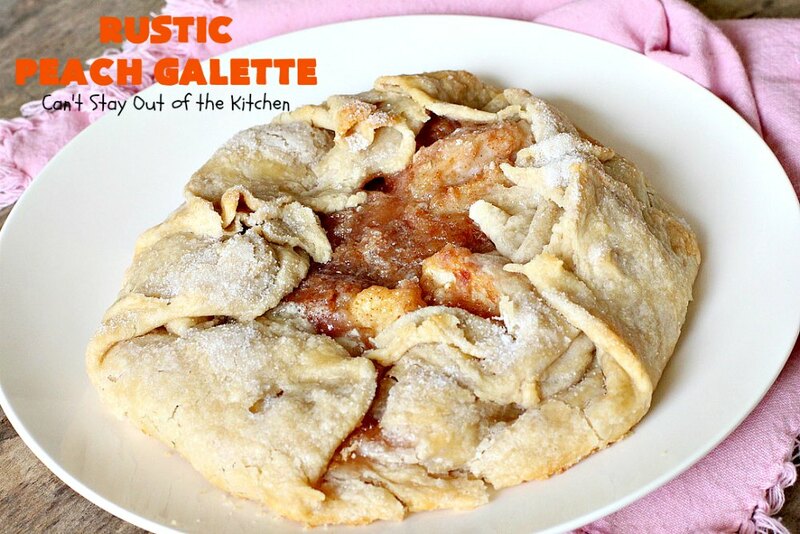 This is enough for two galettes. 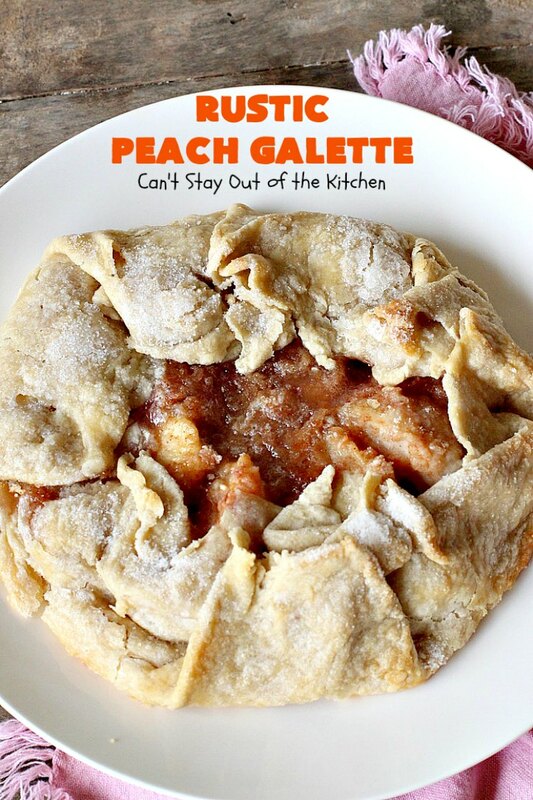 I ended up using more peaches and other ingredients because I made five galettes in all. Peel and slice peaches. I used white flesh peaches. Add flour, sugar, cinnamon, almond extract and lemon juice. Stir to combine. Set aside until pie crust is rolled out. Roll out pie crust rather thickly. This is a little too thin. Place on very large greased cookie sheets. Place peach mixture on top of pie crust. Fold the outside edges in toward the center of the galette. Overlap the dough where necessary. 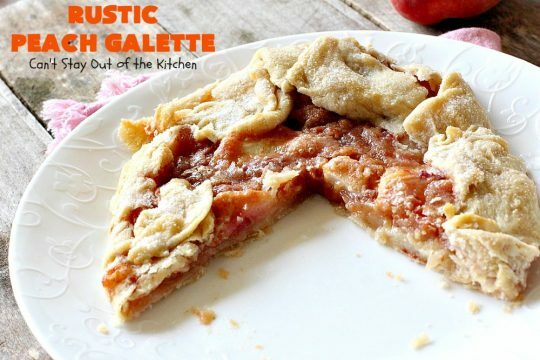 Keep folding edges of pie crust to center of galettes. Brush crust with milk. If you want a more golden color, you can brush with egg yolks. Sprinkle wet crust with sugar. 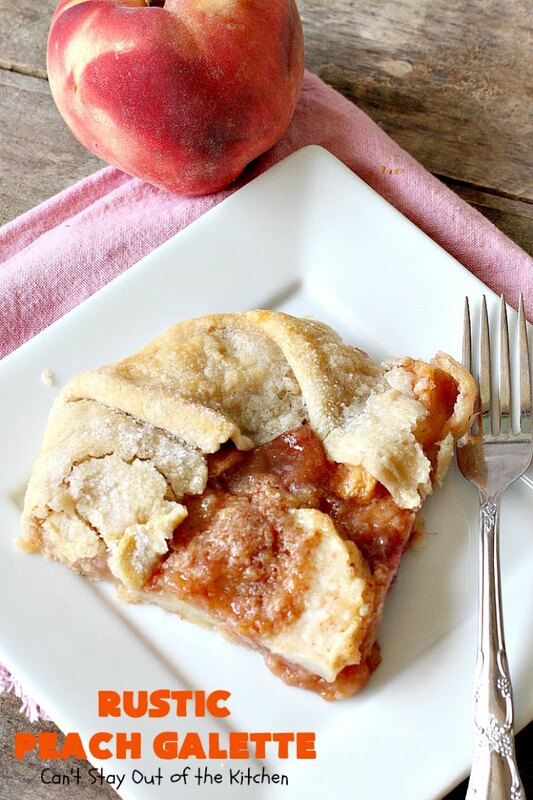 Bake at 350 about 45 minutes or until syrup thickens and peaches are fork tender. Allow galette to cool before transferring to plates. This is the one I saved for ourselves. 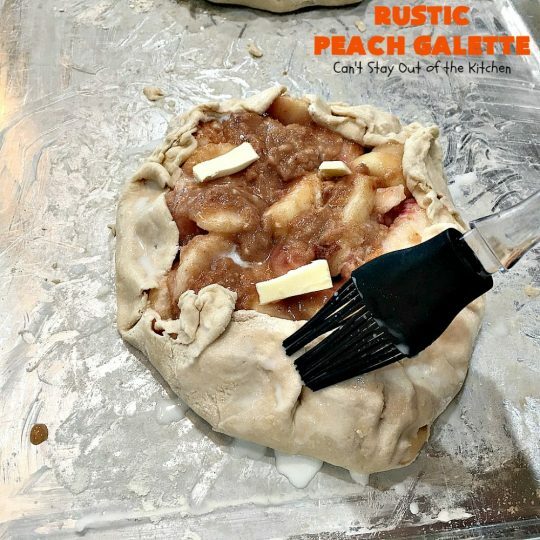 Every bite of Rustic Peach Galette had me drooling. 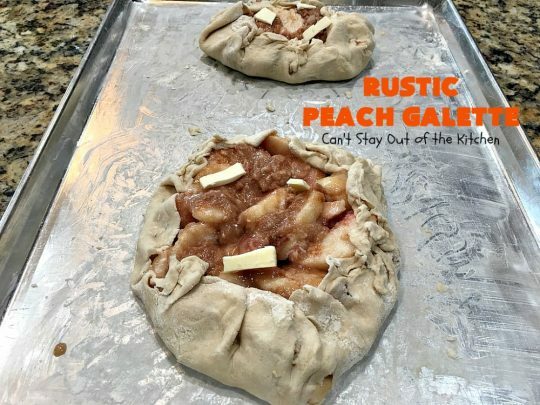 These amazing tarts are filled with beautiful white flesh peaches, cinnamon and almond extract for incredibly delicious and spectacular flavor. Rustic Peach Galette is the perfect dessert for company as everyone always loves this scrumptious, fruity dessert. Grease a large 15x26” cookie sheet (with edges). 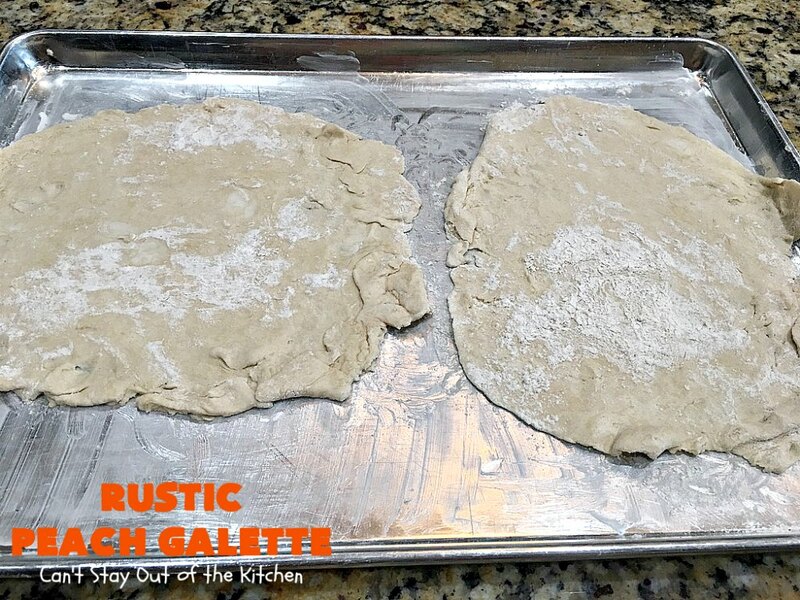 Roll out the pastry to two circles, each about 10-12 inches in diameter. Gently place each pastry into greased cookie sheet. Stir peaches with one cup sugar, flour, cinnamon, almond extract and lemon juice. Spread peach mixture in center of each crust leaving a two-inch border around the outside of the peaches. 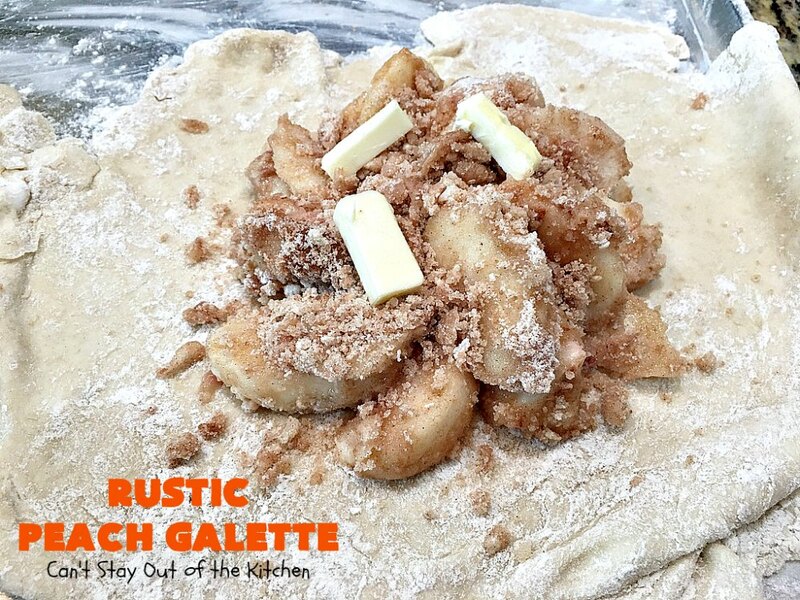 Dot each of the galettes with the butter. 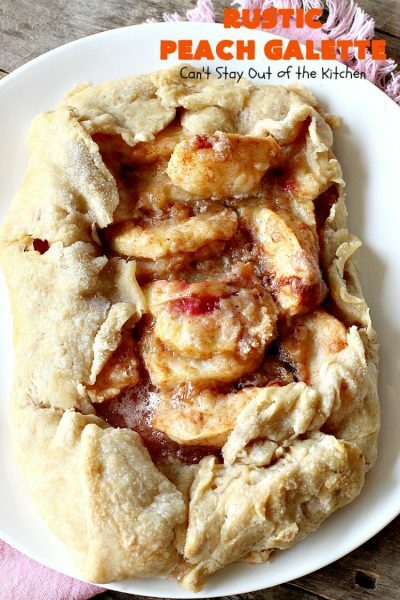 Gently fold up crust over top of the peaches in an overlapping manner. Brush top crust with milk (a tablespoon or two over each). Sprinkle with sugar (a few tablespoonfuls over each until well covered). Bake at 350° about 45 minutes to an hour or until peaches are fully cooked, syrup thickens and bubbles up thickly through the openings in crust. NOTE: You can arrange the peaches in a beautiful pattern, or just toss onto the crust haphazardly—whichever way you prefer. NOTE: I used white flesh peaches. 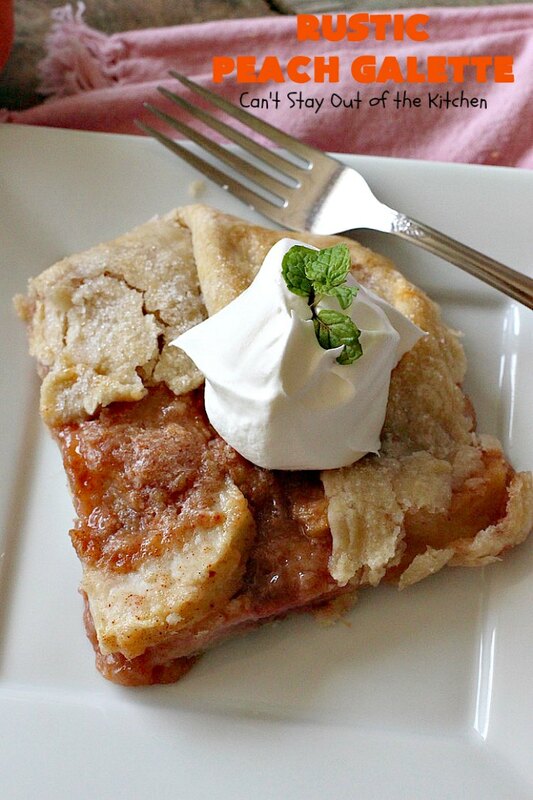 NOTE: You can substitute store-bought pie crust. Rustic Peach Galette is a terrific summer time dessert when fresh peaches are in season. This is also a great dessert for company.